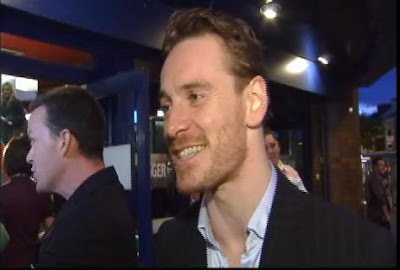 I was anticipating that for the first Basterds premiere outside of Cannes, that Michael Fassbender was going to attend the London premiere yesterday. There was even a few reports stating that he would be there. Then the premiere came and went, and there was no sign of him. In fact, with Michael MIA, no Melanie Laurent, no Eli Roth, and no BRAD PITT (Angelina was in Iraq on a UN mission, so Brad had babysitting duty), the premiere was pretty bland. Check out the images from ONTD!, if you're a Diane Kruger fan, then you will be happy to see her. When I started to review the red carpet images and I saw that Rhianna chick and Mickey Rourke, I knew the premiere was going to be dull. It's amazing the star power that Michael has now and how him not being there can dim down the star wattage. Of course I have no idea why he wasn't there, but I'm sure he's so busy, probably on a little holiday, or doing prep work for Bird Song. Or, maybe he just didn't want to go, actors do have that option to not attend premieres in certain cities. However, they are obligated to attend at least one in a major city, so I reckon he's saving himself for the German premiere and most definitely the LA one. Well, since there are no red carpet discussions for Michael this week, there's not much else to report about at the moment. I'm emotionally drained as it's been a difficult past few days for me due to some personal issues. But like the saying goes, 'This too shall pass'.